Well it’s the first Friday of February, so it’s a perfect time to sit down and have a pint with The Beer Snobs. On this show we review Black Market Brewing Co. Hefeweizen and Alaskan Brewing Co. Alaskan Amber. 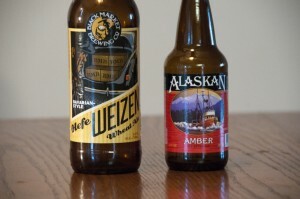 Posted in Blind Taste Testing (2011 - 2013) and tagged Alaskan Amber, Alaskan Brewing Co, Amber, Black Market Brewing Co., Hefeweizen. BM Hef is not usually sour. There’s typically a banana clove taste to it. I think you got a skunky bottle. That is actually what we figured out after the initial review. It did end up getting a retry on Episode 93 last year and was probably on of the better hefeweizen that we have had in awhile.